Is The New Watch really the End? So, book five. 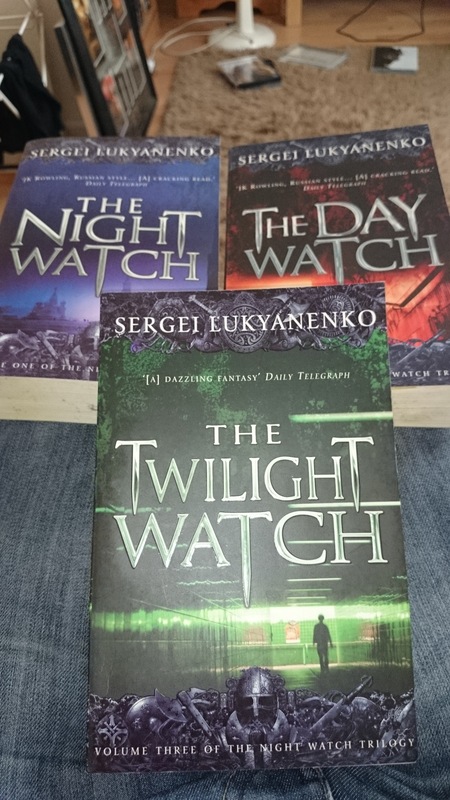 I had very high hopes for Sergei Lukyanenko’s The New Watch. I love the first four and if this one could keep up with those, it was fairly certain I’d feel the same with this one. As it turns out, it did and I do! One thing I did appreciate was that the spelling for Gesar returned in this book, opposed to Geser as featured in The Last Watch. I’m not sure why it bothered me so much but it did. We’re back with Anton Gorodetsky. He’s changed a fair bit since we first met in The Night Watch. He’s moved up the ranks in the Watch and gained a lot of power, which has undoubtedly helped his relationship with Sveta – or that’s what we’re led to believe. His daughter is growing up quickly and her power is unmatched. Although we’ve been introduced to the idea of reading the future with probabilities and such, now we’re really get involved with Clairvoyants and Prophets. Both can spell big trouble for humans and Others and it opens up a whole new mystery about the nature of the Twilight – we’re even asked to question if it’s really alive! Some more historical figures are revealed to us in this volume, expanding on the theory that most of the mythological and notable figures in our history were actually Others, explaining their talents in whatever field they were in. It’s an interesting idea and certainly gives our writer a lot to work with and plenty of people for Anton to meet. Zabulon doesn’t play a massive part in this story, much like the last, and that’s a shame. I do enjoy his meddling. Arina also returns once more, even more powerful than before. I’m sensing a pattern here, with her. Ever since their first meeting in The Twilight Watch I had an idea that they were going to get into it and this might be their last chance if there really are only five books in the series (it’s no longer a trilogy with a sequel). It’s an interesting idea and one Anton must get to grips with and make a decision on at various times through the book. There doesn’t seem to be a right or wrong answer so please tell me your theories on this. It’s implied that the Twilight itself might be alive in some form and that it is at risk from Anton’s daughter, Nadia, nonetheless. It all comes down to the prophecies spoken and heard, making this a battle for survival. In that case, who is right and can anything be done to change destiny? Small changes have been made before, of course, thanks to the book of Destiny and Chalk from the original trilogy but what about on a grand scale? I’m not about to give away the answer. So, is this really the end? Honestly, I’m not sure. The ending could work, it does tie up a fair few things but leaves enough things to keep you thinking – and that is key. Think about all the TV shows, films and books you’ve read that tie everything up together. Do you find that you stop thinking about them until you’re reminded of them? I do but if there are things to think and wonder about, they stay with you longer, you go back to try and find out more and you’re more likely to talk about them. The New Watch does this well but I get the feeling that it’s not over. The flip side is I haven’t found anything that might indicate a sixth book is coming (whether it’s final or not). Everything I can find suggests it’s just the five books but I’ve been talking to a few friends who are fans of this series and a couple have said they’ve read about a sixth so we’ll have to wait and see. Either way, The New Watch is not one to miss. If you’re new to the series then get on it so you can enjoy some great books! While I really enjoyed The Night Watch trilogy, the way it ended confused me. I understood what was going on (eventually, after a couple of reads) and while it seemed to close up well and tie everything together, I had a feeling that we weren’t finished with Anton. Throughout the books, we gain a deeper understanding of the Twilight and the role of the Others. It’s not simply a case of telling us the next step of Anton’s life, there’s more to it than that. It’s what The Last Watch, the sequel to the trilogy, handles so well. While not the whole book, a good part of the story is set in a very familiar place for me; in Edinburgh. I was born there and I have family who still live there so I visit when I can – less so now I’m older and working – but I could definitely tell a lot of research and planning had gone into getting it right for readers. Some will never have been there and while I’m not saying I know Moscow like the back of my hand from these books, there are parts that I could look at and remind myself of the books with. I like that. There are attractions like the Edinburgh Dungeons, Edinburgh Castle and even Waverley Station to name a few and the Fringe Festival is also taking place. That’s not completely unrelated but doesn’t play a massive part in what’s going on. There’s the usual crowd in The Last Watch. Anton is our protagonist still and we’ll see Svetlana, Nadiyushka, Gesar (although it’s spelt Geser in this book. That confused me), Zabulon, Arina, Edgar, Semyon and even Egor. We’ll meet new people too, of course as Anton doesn’t stay in one place too long and it’d be boring if this was purely a holiday! The head of Edinburgh’s Night Watch, Foma, is a new acquaintance and we’ll be meeting Galya again, a young werewolf girl who was first introduced in The Twilight Watch. My favourite character also made an appearance again, which I really enjoyed even if it was only briefly. Films don’t really come under my remit here but they’re worth mentioning. While I can and do watch them, they are vastly different from the books. The Night Watch and The Day Watch films are loosely (very loosely) based on The Night Watch book only. They’re worth watching so you can see how different but it annoys me for multiple reasons – that’s another story. When references are made to events in other books, a note is placed at the bottom of the page so the reader can check up on it, which is great if it’s been a while. This happens in The Last Watch as Anton thinks about what might have happened in another situation or life. It’s a bit of a nod but for me, puts some distance between the films and the books. Needed distance. Tell me if you agree! I don’t want to give too much away by going into a lot of detail but the Merlin myth is introduced to us in The Last Watch. I say introduced because it’s one of the stronger links made out of all four books – at least that I related to. It makes sense in a lot of ways for it to appear in this book given the setting and it provided a much deeper background to the world and history of the Others and the Twilight. It was handled very well, treated as myth and history up until the end where the revelations are made. I found myself guessing what might come up throughout the book and while I got some small details right, I was actually way off with a lot of my ideas. This was a really good way to end off the books, at least for now. I’d have been quite happy to have no more at this point – yes, there are more things I’d like to know but I like that. It keeps me going back for more, digging up clues I might have missed. The story came back on itself and I was content with that. However, there is more to come, as I found out earlier this year! Check back next week to find out what that is. I mean, I’m honestly not sure where to start with this one – it’s fantastic! It’s been a long time since I’ve found a book that I enjoy so completely that it’s easily to become lost in. I’m a writer myself (hopefully you know this by now) and when you combine that with my education in writing, it’s very hard to turn that critical mind off and just enjoy something. There are plenty of books that people enjoy that I just can’t now – even if I used to before. Gid and the Arborinium Prophecy is almost like a reset button – and one well needed! Not only was there very little I could pick on (and anything like that is down to personal preference and not objective criticism) but it flowed so well, which is something I value a lot in a book. So, what captivated me the most? I t can be difficult to find the balance between descriptive text and moving the plot forward. I’m a massive fantasy fan and some of my favourite works are said to be boring and tedious because of this. It’s something I’m aware of but I enjoy being able to close my eyes and know every detail of that scene and location the writer describes. Both the world we know and the new one Andy Gee introduces us to are clear enough for us to see without any trouble. What’s more impressive is the way that all descriptions add something to the story. Not a word is wasted and while he could easily have gone into more detail that adults may have enjoyed and appreciated, his first audience are younger readers and taking that risk is not worth it. It’s a balancing act and one he has handled well. Gid, our protagonist, is a normal kid. That’s our introduction and it’s something he refers to himself throughout the story. There are lessons to be learned here – and not just one, no, there are plenty. As Gid grows, the world he sees changes before him and the same for the reader. This development is natural and there is a point to everything that happens. However, he is not alone and has a wonderfully vibrant range of characters that help him along the way – or not, as the case may be. You won’t come across them all straight away, and you may leave them to re-join them later but they stand out and prove that while Gid is special, while he’s our hero, this is not solely his story. My favourites are Ash and Gecks. That’s all I’m saying. You’ll meet them later and when you understand their relationship, you’ll see why I like them so much! As I mentioned before, the pace is great but it does slow down at times. In some stories, that would be a problem but not here. The emotions can be intense, you can’t help rooting and feeling for Gid and you might not even realise how invested you are until things slow down a little and you can recover from it. There are a couple of points in the book that had my heart racing and I didn’t even realise until after. It was crazy – this is for young readers yet it still has pull over older and adult audiences. Tricky to do, so kudos, Mr. Gee. You don’t have to take my word for it, either. Head over to Amazon where you can buy the paperback and Kindle versions of Gid and the Arborinium Prophecy as well taking a look at the other reviews people have left. They’re all positive so far and it goes to show just how well Andy Gee has captured this world, his characters and audiences of both the young and old. It’s a fantastic start to what promises to be a great writing career! I have a number of friends who are writers, and we’ve all taken different routes to get to where we are today and where we want to be. Amy Baker is a good friend of mine (and a bit of rival – who I’m losing to right now!) and we’ve had many conversations about writing and books. Sound dull? Maybe, but then why are you here, on a blog about writing and books?! Exactly. So we have Number 5, a fictional story set in Bradford and other locations in the country. With a great, flowing narrative and detailed characters, this is a story with real weight and impact behind it. It will open your eyes to parts of the world you didn’t see before – or maybe you didn’t want to. Safe to say that Number 5 isn’t what I normally read – I’m normally a science fiction, fantasy and horror fan. If university has taught me one thing, however, it’s that I shouldn’t be afraid to get out of my comfort zone and try something new. So, when Amy tells me her book is available, I figured it was a good time to give it a shot – and I already told her I would. Now, a book on prostitution on the streets of Bradford definitely got me thinking. I wasn’t sure how close I could get on with this and the protagonist, Gemma, was written in a way I didn’t really enjoy. On the other hand, she was consistent and showed great development so I was able to appreciate that. It’s encouraging to see character development as an important part to a story. In all honesty, there wasn’t much I could relate to Gemma with. Her life and personality are very different from my own, for obvious and not so obvious reasons. I was able to understand where she was coming from – especially the desire to move on from the past. That’s something that I think most people can understand, at least one some level. Even without that, it’s clear that it’s a serious situation but the story doesn’t revolve around that. It starts with it and it’s always there, sometimes on the periphery, but Gemma’s journey to find a better life, to become the person she’s always wanted to be is also something I get. Am I making a little light of the situation? Sure, but I like to look at the positives. You’ll understand more when you read the book. Number 5 is definitely something different. I honestly don’t know if I’d go back to it soon, or if I’d stick with that genre – it’s just not me. That doesn’t change the fact that it’s a fantastic book. The story is gripping and written well. It flows great and when the tension rises, you won’t be able to stop reading. I’m always happy to try something new and I’m glad I did with this book. It’s an eye opener and sure that Amy Baker has many more stories to come. If you’re interested in trying Number 5 for yourself, head over to Amazon and grab yourself a copy!